As summer heats up the idea of a long, cool drink is especially appealing. 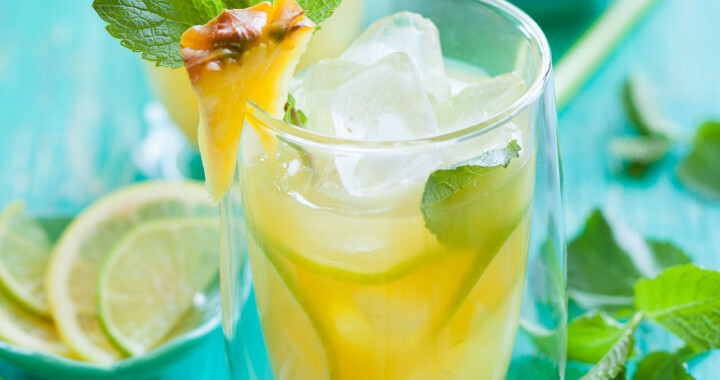 Herbs with a tropical tang, like pineapple or lemon, are the most popular for flavouring cocktails and coolers. The hint of lemon grass, lemon balm or lemon verbena is particularly refreshing while pineapple sage and pineapple mint have a sweeter, more exotic flavour. Mint Julep, which is a cross between garden mint and spearmint, is another delicious option. With the exception of lemon grass which has a wide culinary spectrum, these ‘happy hour’ herbs are nicest as teas or drinks and in fruit based desserts. What they lack in status, compared to culinary heavyweights like basil, thyme, sage, rosemary and marjoram is offset by their good looks in the garden. A bush of pineapple sage covered in sizzling red flowering spikes is simply gorgeous. Pineapple mint is a beautiful groundcover with its scented cream and green variegated leaves and verbena in spring is a picture with its sprays of white flowers. No garden should be without at least one of each kind. The general approach to using herbs in non-alcoholic or alcoholic punches is to make a strong herb infusion which is then added to the other ingredients. To make a strong infusion, use double the amount of herb material that you would normally use for making herbal tea. Generally the proportions for a mild infusion are one third herb material to two thirds water. For a strong infusion the proportions are 50-50. Bring the required amount of water to the boil, take it off the heat and then add the herb. Leave it to steep for about 15 minutes and then strain. It is the amount of herb used and not the length of steeping time that produces the strong infusion. The strong herb infusion can also be boiled up with sugar to make a syrup which is used as the basis for a drink, especially for making herb flavoured lemonade. When using the tougher lemon grass leaves and stalks a quick way to extract its flavour is to pulp two to four leaves in a blender with some water until the mixture has a greenish hue. Strain the mixture and add to the other ingredients. Lemon grass stems and leaves can also be combined with water and sugar and boiled up to make a syrup. Strain and allow the mixture to cool. Any of the ‘Happy Hour’ herbs can be used in this basic recipe. Dress it up with extra fruit, cocktail cherries, crushed ice, etc. Pour boiling water over herb leaves and let it steep for about 15min. to make a strong infusion. Strain the leaves and add the infusion to the fruit concentrate, Soda water and Ginger Ale in a punch bowl. Add to this some lemon slices, fresh leaves and lots of ice. For a refreshing sundowner, add Vodka or flavoured Cane spirit. Posted in Growing Herbs and tagged coolers, fresh, herbs, recipe, refreshing, taste.